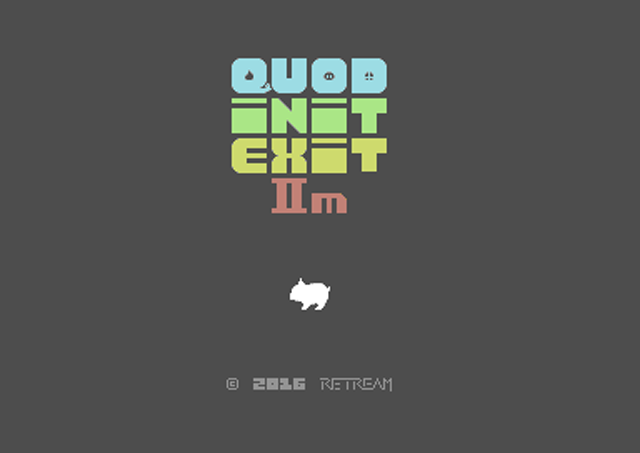 Quod Init Exit IIm is the sequel to Saimo of Retream & 2011 RGCD release: Quod Init Exit. And if you know that game, you'll remember that whatever goes in, must always come out. But not anymore, since all the toilets have been turned into potties and scattered all over Suinio, the previously idyllic world, where our hero Zampo used to roam freely and eat all he wants and relieve himself, you know, wherever. So find the toilets, save the world is the premise. And boy is it fun! 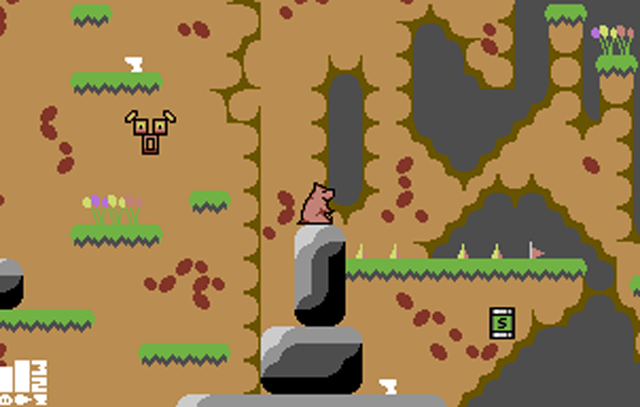 Arcade platformers were perhaps always one of the Commodore 64's greatest strengths: when utilised fully, no other 8-bit computer could match it for scrolling, graphics and high resolution sprites with pixel perfect collision. And Retream has done an amazing job combining these features. While the original game was a single screen arcade blast, this game takes the fun of the first one, and transplants it into one enormous beautiful map. Otherwise inaccessible areas must be reached by combining jumps and Turbo farts which project Zampo horizontally at tremendous speed, then finding the switches to unlock the barriers scattered throughout. 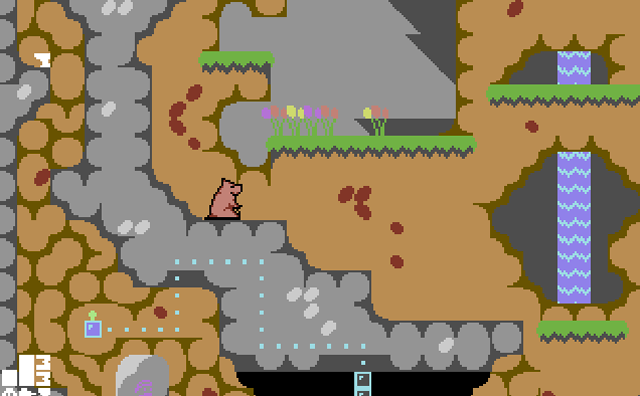 You'll find teleporters to access new areas and constantly be on the look out for food drops and powerups, which will appear frequently as you play. This takes a bit of practice, but when you've mastered the fart jumps, you'll zip around the level with ease. If you're hit by enemies, you'll respawn at a recent checkpoint, and be able to recover health quickly by waiting for a few burgers or fish to arrive, and if you're out of fart power, just wait for some bottles or a "pig of steel" power up and eat an enemy to fully recover all health and farts. Thankfully there's no instadeath, just grind a bit when you're low on food, and you'll be ready for another stab at the next part of the level. Overall a fun, quirky, beautiful and difficult, but extremely addictive brand new game for your C64. And available now from Retream's website. A must have.